The South West Coastal Path is one of the longest footpaths in Britain 515 miles long. The West Peninsular Coast Path follows the coastline from Minehead in Somerset through Devon, Cornwall to the mouth of Poole Harbour in Dorset. It consists of four linked routes, the Somerset and North Devon Coast path, the Cornish coastal path, the South Devon coast path and the Dorset Coast path. Running parallel to the sea the path keeps as close as possible to hill ridges and the cliff edge. Starting from Minehead The path climbs from Minehead Quay along the cliffs that line the Bristol Channel. Lynton and Baggy Point produce a impressive cliff backdrop to wonderful scenery. Woolacombe and Croyde Bay have wonderful expanses of sand.. Beyond Braunton Burrows lays the Torridge Estuary from here you could detour inland via Barnstaple across the Instow / Appledore ferry picking the path up at Westward Ho! beyond the stony foreshore the picturesque village of Clovelly is found with steep narrow pedestrian cobbled streets meandering down to the harbour. From here the coast path runs west along a remote stretch of cliff tops. The Atlantic with its huge rolling waves can be seen for the first time on reaching Hartland Point. Here magnificent arches and pinnacles formed from the eroding rocks may be seen along with rock formed reef lines running into the sea. Marsh Mouth lays on the boundary of Devon and Cornwall here it meets the sea. Between Marsh Mouth and Bude the flat topped cliffs lay in isolation with few access points. At low tide Bude can be reached by following the beach from Coombe Valley. The path ascends again to lonely cliffs stretching past Widemouth Bay to Crackington Haven and the headland of Cambeak, onto the pretty harbour of Bostcastle. Four miles beyond the ruins of the 12th century castle of Tintagel can be seen on a small almost detached headland jutting out to sea. The 7 miles between Trebarwith Strand and Port Gaverne is seclude. Next comes the pretty 14th century fishing village of Port Isaac along to Pentire Point, here the river camel meet the sea. Stepper Point is in view over the sandy estuary. The estuary is now crossed from Rock to Padstow by ferry. South West Coast Path Trevose Head to Prawle Point Turning south at Trevose Head you come to the most popular coast used for holidays stretching to Newquay and beyond. South of Newquay lie Penhale Sands under which a Saxon Church is buried, its site marked with a cross. Reskajeage Downs provide one of Cornwalls splendid cliff lines this is found between Portreath and Gwithian. 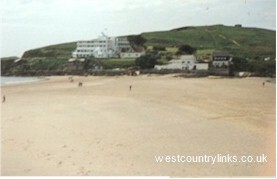 St.Ives one of Cornwalls more famous resorts may be reached by a short detour inland. Originally a fishing port it became a haven for artists at the end of the 19th century. Continue along the cliff to St.Just and Cape Cornwall, an alternative inland route passes through Zennor and Morvah. Lands End has a wonderful atmosphere with its huge granite cliffs pounded relentlessly by the Atlantic sea. From here on turning east you past by the Minack Open Air Theatre to Treen. Next come the pretty fishing villages of Lamorna Cove and Mousehole. St. Micheals Mount Island with its castle dominates the town of Penzance. Praa Sands and Looe bar are a mile long shingle bank holding back the largest natural lake in the West Country. From here we past several impressive coves, Mullion, Kynanc and past Lizard Point Cadgwith are the most well known. After crossing the river Helford by ferry you come to the harbour of Falmouth crossed by yet another ferry you come to the secluded Roseland peninsula here you can visit St.Just-in-Roseland's pretty church, then onto craggy Nare Head. Eight miles further you come to Dodman Point on a massive 400ft promontory. The south coast of Cornwall with more built up areas is not as savage as the North Coast but it does have some remote stretches around Black Head north of the pretty fishing harbour of Mevagissey. This popular coast has many places to visit with lovely beaches, old worlde fishing villages with narrow winding streets, Mevagissey, Fowey, Polruan, Polperro, West and East Looe, and Cornwalls forgotten Corner Kingsand and Cawsand from here make your way to Cremyll, the path then crosses into Devon over the river Tamar via the Cremyll Ferry which has been in use since the 13th century into the city of Plymouth. The path follows the foreshore giving views of historic military establishments, The Ferry Port, The Hoe and the Barbican leaving Plymouth via Turnchaple and Hooe heading towards Wembury. Now head for the extensive sands of Bigbury -on-Sea a short walk across the beach brings you to Burgh Island Agatha Christie used this location for one of her books, if the tides in there is a large tractor like vehicle that is used to transport visitors back and forth, then onto Thurlestone you could detour inland to Kingsbridge otherwise carry on past a number of fine headlands including Bolt Tail and Bolt Head. Salcombe is a pretty yachting community with its red sands and pretty town its well worth a stop here. Beyond the sandy coves east of Prawle Point the coast path reaches Start Point, with its lighthouse where the coast turns north towards the shingle bank at Slapton. For a short stretch the A379 road comes away from the cliff. Then comes the historic pretty town of Dartmouth on its lovely estuary. Follow the coastal path through Kingswear , Dartmouth to Crabrock Point, on to Goodrington and Hopes Nose in the built-up Torbay resort area, between Teignmouth and Dawlish, and from Dawlish Warren to Starcross, from which the ferry crosses the Exe Estuary to Exmouth. There are high cliffs in formations all the way to Beer Head (400ft). From here to Lyme Regis and beyond the coast has been subject to landslides. At Dowlands Heads Cliffs, near Axmouth, 20 acres of cliff subsided in 1839 taking cottages and fields with them and leaving a rock face 2000ft high above a boulder-strewn ridge three-quarters of a mile long. Half a mile west of Lyme Regis the path crosses into Dorset. Immediately beyond the town with its coloured cliffs, fossils you continue past Black Ven, Golden Cap to West Bay and Burton Bradstock. Abbotsbury is worth a stop its well known for its swannery. Here the great shingle ridge of chisel beach begins following this you can reach the Isle of Port Land. Head through the Weymouth resort to pretty Lulworth Cove, beyond comes a break in the path due to the Tyneham military firing ranges. The coast from here to Kimmeridge Bay is sometimes shut off. An inland road is also closed during firing, when a 14 mile detour through Wareham is necessary. Beyond Kimmeridge the Limestone cliffs continue to Swanage, on the other side chalk reappears at The Foreland and Old Harry Rocks. Going northwards from here leads you by Studland Heath to end the walk at South Haven Point, at the mouth of Poole Harbour.